The growing potential of robotics in the medical field leads to face challenging problems, but at the same time creates great expectations in society, as new devices and equipment are envisioned as killing solutions with respect to current technology. The IBEC’s Robotics group research aims to contribute to the slow but continuous advances in the medical field, in the areas of assistance to disabled, in rehabilitation and assistance in surgery. A common factor in these three areas is the need of adaptation to the user’s needs, what implies perceiving not only the user’s will and status, but also the environment conditions and the evolution of the ongoing activity. Our current research within the HYPER project (Hybrid Neuroprosthetic and Neurorobotic Devices for Functional Compensation and Rehabilitation of Motor Disorders) is to search for new adaptive control algorithms focusing on specific actions, as the transition from sit to stand or keeping the walking pattern under internal or external perturbations. This control has to deal with disturbances caused by muscle synergies, taking into account unpredictable effects of artificial stimulation in muscles during rehabilitation therapies or other effects as fatigue or the own user’s attention to the therapy. In this field, the work carried out has been focused on developing a control system with variable hierarchy and a status evaluator that allows adapting the control variables, mainly the variable stiffness at each joint, to reach the desired response and stability. Being human-robot interaction a key factor in medical robotics, our research in assistive robotics is devoted to interpret human activity and the operation context so as to be able to program robots to cooperate proactively in assisting disabled in their daily tasks. This implies the extraction of relevant image features to recognize human posture and actions and relate them to the context environment and the evolution of tasks and activities, using recognition and learning techniques. The challenge is finding adequate algorithms that are reliable enough and can reduce the amount of data to process so as to be able to operate in real time. Figure 1 shows the original data, the human joints, and the reduction of triangles, trisarea feature, that define each posture in a sequence of poses corresponding to the human movement. For the adequate robot control this information has to be compatible with the environment status, thus perception and context interpretation is necessary. Further work has been done on the integration of multiple robot arms to deal with tasks that need cooperative actuation. The research in surgical robots has progressed going deeper in the development of robot aids, as the analysis of tissues deformation aiming to solve problems as physiological movement detection for robot motion compensation or for estimation of the force applied on the tissues due to the lack of sensors to be integrated on the surgical tools. Fig. 2 shows a sequence of images of the heart and the changes produced on the heart surface by the forces applied. The image processing operates from the minimization of an energy functional using the l_1−regularized optimization class in which cubic b-splines are used to represent the changes produced on the heart surface. In technology transfer, much progress has been done in the spin-off, Rob Surgical Systems S.L, having already started the experimentation with models in an experimental operating room and advancing in the regulatory process. We have also advanced in the Surgitrainer project, a training simulator for minimally invasive surgery and a new specific robotic trainer has been designed, built and evaluated in Hospital de Sant Pau and in the Leuven premises of our partner, as part of the European Society for Gynaecological Endoscopy. We are now in process of creating a company. The aim is to progressively advance in new robot surgical techniques that assist surgeons from the training phase to their assistance in clinical interventions. IBEC group leader Alicia Casals received a 2015 fem.talent Award at the fem.talent Fòrum in Barcelona on Friday. Alicia won the prize for “Career trajectory”, recognising such milestones as the creation in 2011 of IBEC/UPC spin-off Rob Surgical Systems. Other award categories were “Emerging Talent”, “Innovation” and “Communication”. Today, La Vanguardia (left) and Interempresas.net report that Rob Surgical Systems, the IBEC/UPC spin-off company, has started validating its Bitrack Surgical Robot System for minimally invasive laparoscopic surgery. On Tuesday, Robotics group leader Alícia Casals was interviewed about her field of research in the programme ‘Illa Robinson’ on the TV channel El Punt Avui. IBEC group leaders Alícia Casals and Santiago Marco feature in a Sunday supplement about robots in La Vanguardia this week. IBEC is mentioned in the press today in relation to the HYPER project, of which the Robotics group is a partner. The story reveals the start of some pilot tests with real spine patients at the Hospital Nacional de Parapléjicos de Toledo with the robots being developed by the project, which aims to develop new treatments in neurorehabilitation and help with patients’ mobility. Emili Boronat from IBEC’s Robotics group appeared on TV3’s Info K programme yesterday after taking part in the presentation of the initiative ‘Investiga amb RecerCaixa!’ at Cosmocaixa in Barcelona alongside 9 other researchers from other institutions. A prototype developed by IBEC’s Robotics group and their collaborators was presented at the European Society for Gynaecological Endoscopy’s 22nd Annual Congress in Berlin last month. IBEC’s Robotics group leader Alicia Casals features in an article in Regió 7 (“El diari de la Catalunya central”) and other sites about next week’s (re)Make conference on information and communication technologies. IBEC’s Robotics group leader Alícia Casals represented Catalonia’s scientific community when she and two doctors, a psychiatrist and a biomedical researcher read out a poem at the Concert per la Llibertat at Camp Nou on 29th June. Tuesday 2nd April’s edition of Catalan daily magazine Ara features an article about the minimally invasive robotic station for surgery, Bitrack, which is being developed by IBEC’s spin-off company, Rob Surgical Systems. IBEC’s Robotics group leader Alícia Casals was interviewed on local radio station Radio Rubí this week. The interview formed part of the Rubí al dia programme’s celebration of International Women’s Day by featuring women with interesting jobs. IBEC Senior Researcher Joan Aranda’s project ‘InHANDS: robòtica interactiva per a l’assistència humana en l’entorn domèstic’ has been awarded funding by the RecerCaixa programme. Diario Vasco, the daily newspaper published from San Sebastian, featured a report and video about the HYPER project, of which IBEC’s Robotics group is a partner. IBEC featured on 8tv’s ‘Equip de Reporters’ programme on Sunday night, which was entitled ‘Investigant la investigació’ and focussed on public and private funding for science. Joan Aranda of the Robotics group demonstrated the experimental robotic kitchen as as example of the group’s privately-supported work in developing intelligent robotic systems. Head of Corporate Projects Arantxa Sants commented on the current financial situation in relation to the research community, pointing out that private funding is always needed and welcome even in affluent times. IBEC’s Alícia Casals is one of the famous Catalans featured in a new card game aimed at familiarising children with scientific vocabulary. Alícia Casals’ Robotics laboratory was featured on Barcelona Televisió’s programme “Connexió” on Tuesday 10th January, where they showed some of the robotic devices that the lab is currently developing. On 23 October, IBEC’s Robotics lab was featured in an episode of ‘Emprendedores e innovadores’ on TVE2. Robotics group leader Alicia Casals was interviewed on the Catalunya Ràdio programme “El Café de la República”, broadcast on 3 November at 22:00. Tonight at the Institute of Catalan Studies (IEC) in Barcelona, IBEC group leader Alicia Casals will inaugurate the beginning of their new academic year with a lecture, “Neurorobòtica, el repte de la robòtica assistencial”. PhD student Xavier Giralt was interviewed for the ‘Gente corriente’ section on the back page of Saturday’s El Periódico. Robotics group leader Alícia Casals appeared last week in Catalan local paper El 9 Nou, which covers the Osona/Ripollès and Vallès Oriental areas. Alícia gave a lecture about this century’s challenges in robotics at the 3rd Workshop on Mechatronics at the University of Vic on 16 February. Alícia Casals, head of IBEC’s Robotics group and one of the researchers included in the exhibition “16 Catalan Women Scientists” (16 científiques catalanes), will take part in a round table discussion with other participants on 14 December entitled “Women, Society and Science: Breaking the glass ceiling”. IBEC’s Robotics group leader Alícia Casals features in an online article in Science Careers magazine, the careers component of the journal Science. The bioengineer Alícia Casals, group leader of the robotics research program at the Institute for Bioengineering of Catalonia (IBEC) will be recognized for her work as a research scientist in the “16 Científiques Catalanes” exhibition being organized by the Associació Catalana de Comunicació Científica. Abstract Wearable robots are expected to expand the use of robotics in rehabilitation since they can widen the assistance application context. An important aspect of a rehabilitation therapy, in terms of lower extremity assistance, is balance control. In this article, we propose and evaluate an adaptive control strategy for robotic rehabilitation therapies to guarantee static stability using a wearable robot. Postural balance control can be implemented either acting on the hip, on the ankle joint or on both, depending on the kind of perturbation acting on the subject: internal or external. Internal perturbations can be produced by any voluntary movement of the body, such as bending the trunk. External perturbations, in the form of an impact force, are applied by the exoskeleton without any prior notice to observe the proactive response of the subject. We have used a 6 degree of freedom planar lower limb exoskeleton, H1, to perform this analysis. The developed control strategy has been designed to provide the necessary assistance, related to balance recovery and postural stability, under the â€œAssist-as-neededâ€ paradigm. The interaction forces between orthosis and subject are monitored, as they play a relevant role in the definition of assistive and resistive movements to be applied to the joints. The proposed method has been tested with 5 healthy subjects in presence of internal and external disturbances. The results demonstrate that knowing the stability limit of each subject, in combination with a therapeutically selected scaling factor, the proposed adaptive control helps in providing an effective assistance in therapy. This method is efficient in handling the individual and combined effect of external perturbations acting on any joint movements. The use of multiple robots working cooperatively in a redundant way offers new possibilities in the execution of complex tasks in dynamic workspaces. The aim of this work is to increase the range of applicability of teleoperated systems by means of the automatic cooperation of multiple slave robots which, controlled by a human operator, act as if they were a unique robot: a Multi-Robot Cooperation Platform for Task-Oriented Teleoperation, MRCP. From the human operator commands, this robotic platform, the MRCP, dynamically selects the most suitable slave robot and manages, when necessary, a task transfer from one robot to another in order to achieve a smooth execution of teleoperated tasks. The result of the proposed methodology is an improved teleoperated system in terms of reachable workspace (volume, manoeuvrability and accessibility) and dexterity, thus widening its range of applicability. This approach allows human operators to focus their attention on the ongoing task more than on the teleoperated robots. This paper presents a new rehabilitation system that is able to adapt its performance to patient's psychophysiological state during the execution of robotic rehabilitation tasks. Using this approach, the motivation and participation of the patient during rehabilitation activity can be maximized. In this paper, the results of the study with healthy subjects presented in (Badesa et al., 2014b) have been extended for using them with patients who have suffered a stroke. In the first part of the article, the different components of the adaptive system are exposed, as well as a comparison of different machine learning techniques to classify the patient's psychophysiological state between three possible states: stressed, average excitation level and relaxed are presented. Finally, the results of the auto-adaptive system which modifies the behavior of the rehabilitation robot and virtual task in function of measured physiological signals are shown for a patient in the chronic phase of stroke. In computer-assisted beating heart surgeries, accurate tracking of the heart's motion is of huge importance and there is a continuous need to eliminate any source of error that might disturb the tracking process. One source of error is the specular reflection that appears on the glossy surface of the heart. In this paper, we propose a robust solution for the detection and removal of specular highlights. A hybrid color attributes and wavelet based edge projection approach is applied to accurately identify the affected regions. These regions are then recovered using a dynamic search-based inpainting with adaptive windowing. Experimental results demonstrate the precision and efficiency of the proposed method. Moreover, it has a real-time performance and can be generalized to various other applications. An automatic gait initialization strategy based on user intention sensing in the context of rehabilitation with a lower-limb wearable robot is proposed and evaluated. The proposed strategy involves monitoring the human-orthosis interaction torques and initial position deviation to determine the gait initiation instant and to modify orthosis operation for gait assistance, when needed. During gait, the compliant control algorithm relies on the adaptation of the joints' stiffness in function of their interaction torques and their deviation from the desired trajectories, while maintaining the dynamic stability. As a reference input, the average of a set of recorded gaits obtained from healthy subjects is used. The algorithm has been tested with five healthy subjects showing its efficient behavior in initiating the gait and maintaining the equilibrium while walking in presence of external forces. The work is performed as a preliminary study to assist patients suffering from incomplete Spinal cord injury and Stroke. The lack of force feedback is considered one of the major limitations in Robot Assisted Minimally Invasive Surgeries. Since add-on sensors are not a practical solution for clinical environments, in this paper we present a force estimation approach that starts with the reconstruction of a 3D deformation structure of the tissue surface by minimizing an energy functional. A Recurrent Neural Network-Long Short Term Memory (RNN-LSTM) based architecture is then presented to accurately estimate the applied forces. According to the results, our solution offers long-term stability and shows a significant percentage of accuracy improvement, ranging from about 54% to 78%, over existing approaches. Stroke is a leading cause of adult disability with upper-limb hemiparesis being one of the most frequent consequences. Given that stroke only affects the paretic arm's control structure (the set of synergies and activation vectors needed to perform a movement), we propose that the control structure of the non-affected arm can serve as a physiological reference to rehabilitate the paretic arm. However, it is unclear how rehabilitation can effectively tune the control structure of a patient. The use of Visual Feedback (VF) is recommended to boost stroke rehabilitation, as it is able to positively modify neural mechanisms and improve motor performance. Thus, in this study we investigate whether VF can effectively modify the control structure of the upper-limb. We asked six neurologically intact subjects to perform a complete upper-limb rehabilitation routine comprised of 12 movements in absence and presence of VF. Our results indicate that VF significantly increases interlimb similarity both in terms of synergies and activation coefficients. However, the magnitude of improvement depended upon each subject. In general, VF brings the control structure of the nondominant side closer to the control structure of dominant side, suggesting that VF modifies the control structure towards more optimized motor patterns. This is especially interesting because stroke mainly affects the activation coefficients of patients and because it has been shown that the control of the affected side resembles that of the nondominant side. In conclusion, VF may enhance motor performance by effectively tuning the control-structure. Notably, this finding offers new insights to design improved stroke rehabilitation. In this paper, we propose a new approach to domestic action recognition based on a set of features which describe the relation between poses and movements of both hands. These features represent a set of basic actions in a kitchen in terms of the mimics of the hand movements, without needing information of the objects present in the scene. They address specifically the intra-class dissimilarity problem, which occurs when the same action is performed in different ways. The goal is to create a generic methodology that enables a robotic assistant system to recognize actions related to daily life activities and then, be endowed with a proactive behavior. The proposed system uses depth and color data acquired from a Kinect-style sensor and a hand tracking system. We analyze the relevance of the proposed hand-based features using a state-space search approach. Finally, we show the effectiveness of our action recognition approach using our own dataset. This paper addresses the issue of lack of force feedback in robotic-assisted minimally invasive surgeries. Force is an important measure for surgeons in order to prevent intra-operative complications and tissue damage. Thus, an innovative neuro-vision based force estimation approach is proposed. Tissue surface displacement is first measured via minimization of an energy functional. A neuro approach is then used to establish a geometric-visual relation and estimate the applied force. The proposed approach eliminates the need of add-on sensors, carrying out biocompatibility studies and is applicable to tissues of any shape. Moreover, we provided an improvement from 15.14% to 56.16% over other approaches which demonstrate the potential of our proposal. In this paper, a heuristic method based on Firefly Algorithm is proposed for inverse kinematics problems in articulated robotics. The proposal is called, IK-FA. Solving inverse kinematics, IK, consists in finding a set of joint-positions allowing a specific point of the system to achieve a target position. In IK-FA, the Fireflies positions are assumed to be a possible solution for joints elementary motions. For a robotic system with a known forward kinematic model, IK-Fireflies, is used to generate iteratively a set of joint motions, then the forward kinematic model of the system is used to compute the relative Cartesian positions of a specific end-segment, and to compare it to the needed target position. This is a heuristic approach for solving inverse kinematics without computing the inverse model. IK-FA tends to minimize the distance to a target position, the fitness function could be established as the distance between the obtained forward positions and the desired one, it is subject to minimization. In this paper IK-FA is tested over a 3 links articulated planar system, the evaluation is based on statistical analysis of the convergence and the solution quality for 100 tests. The impact of key FA parameters is also investigated with a focus on the impact of the number of fireflies, the impact of the maximum iteration number and also the impact of (α, β, γ, δ) parameters. For a given set of valuable parameters, the heuristic converges to a static fitness value within a fix maximum number of iterations. IK-FA has a fair convergence time, for the tested configuration, the average was about 2.3394 × 10−3 seconds with a position error fitness around 3.116 × 10−8 for 100 tests. The algorithm showed also evidence of robustness over the target position, since for all conducted tests with a random target position IK-FA achieved a solution with a position error lower or equal to 5.4722 × 10−9. Pose-based features have demonstrated to outperform low-levelappearance features in human action recognition. New RGB-D cameras provide locations of human joints with which geometric correspondences can be easily calculated. In this article, a new geometric correspondence between joints called Trisarea feature is presented. It is defined as the area of the triangle formed by three joints. Relevant triangles describing human pose are identified and it is shown how the variation over time of the selected Trisarea features constitutes a descriptor of human action. Experimental results show a comparison with other methods and demonstrate how this Trisarea-based representation can be applied to human action recognition. A user intention based rehabilitation strategy for a lower-limb wearable robot is proposed and evaluated. The control strategy, which involves monitoring the human-orthosis interaction torques, determines the gait initiation instant and modifies orthosis operation for gait assistance, when needed. Orthosis operation is classified as assistive or resistive in function of its evolution with respect to a normal gait pattern. The control algorithm relies on the adaptation of the joints’ stiffness in function of their interaction torques and their deviation from the desired trajectories. An average of recorded gaits obtained from healthy subjects is used as reference input. The objective of this work is to develop a control strategy that can trigger the gait initiation from the user’s intention and maintain the dynamic stability, using an efficient real-time stiffness adaptation for multiple joints, simultaneously maintaining their synchronization. The algorithm has been tested with five healthy subjects showing its efficient behavior in initiating the gait and maintaining the equilibrium while walking in presence of external forces. The work is performed as a preliminary study to assist patients suffering from incomplete Spinal cord injury and Stroke. The lack of physiological motion compensation is a major problem in robotic-assisted cardiac surgery. Since the heart is beating while the surgeon carried out the procedure, dexterity of the surgeon’s and precision are compromised. Due to the operative space and the visibility of the surgical field are reduced, the most practical solution is the use of computer vision techniques. The lack of efficiency and robustness of the existing proposals make physiological motion compensation to be considered an open problem. In this work a novel solution to solve this problem based on the minimization of an energy functional is presented. It is described in the three-dimensional space using the l1−regularized optimization class in which cubic b-splines are used to represent the changes produced on the heart surface. Moreover, the logarithmic barrier function is applied to create an approximation of the total energy in order to avoid its non-differentiability. According to the results, this proposal is able to deal with complex deformations, requires a short computational time and gives a small error. Robotic rehabilitation is an emerging technology in the field of Neurorehabilitation, which aims to achieve an effective patient recovery. This research focusses on the control strategy for an assistive exoskeleton aiming to reduce the effects of disturbances on planned trajectories during rehabilitation therapies. Disturbances are mostly caused by muscle synergies or by unpredictable actions produced by functional electrical stimulation. The effect of these disturbances can be either assistive or resistive forces depending on the patient's movement, which increase or decrease the speed of the affected joints by forcing the control unit to act consequently. In some therapies, like gait assistance, it is also essential to maintain synchronization between joint movements, to ensure a dynamic stability. A force control approach is used for all the joints individually, while two control methods are defined to act when disturbances are detected: Cartesian position control (Cartesian level) and Variable execution speed (joint level). The trajectory to be followed by the patient is previously recorded using an active exoskeleton, H1, worn by healthy subjects. A realistic simulation model of the exoskeleton is used for testing the effect of disturbances on the particular joints and on the planned trajectory and for evaluating the performance of the two proposed control methods. The performances of the presented methods are evaluated by comparing the resulting trajectories with respect to those planned. The evaluation of the most suitable method is performed considering the following factors: stability, minimum time delay and synchronization of the joints. This paper presents an application of a classification method to adaptively and dynamically modify the therapy and real-time displays of a virtual reality system in accordance with the specific state of each patient using his/her physiological reactions. First, a theoretical background about several machine learning techniques for classification is presented. Then, nine machine learning techniques are compared in order to select the best candidate in terms of accuracy. Finally, first experimental results are presented to show that the therapy can be modulated in function of the patient state using machine learning classification techniques. For the mechanisms considered under the title linkages, coupler curve is the path traced by one of the point on the coupler link considered as an output of the mechanism which is joined to a fixed link. The equation of the coupler curve generated can be obtained solving a set of equations which describes distance constancy between all points of a mechanism and this coupler curve is the eliminant of these equations. The proposal to this work is to approximate coupler curves using strip trees. Many challenges are still to be overcome, before European robotic community reaches full clearance on how to commercialize surgical robots, even more if they are endowed with some cognitive features. Besides the technical difficulties of developing such devices from the engineering and medical point of view, firm obstacles are also present regarding the social, legal and ethical implications that will arise, once this technology is available and ready to use for surgical purposes. This presents the results reached by the coordinated action Eurosurge to face non-technical roadblocks foreseen in future robotic surgery, including recommendations for the robotic, legal and medical communities involved in this field. Compensating physiological motion in the context of minimally invasive cardiac surgery has become an attractive issue since it outperforms traditional cardiac procedures offering remarkable benefits. Owing to space restrictions, computer vision techniques have proven to be the most practical and suitable solution. However, the lack of robustness and efficiency of existing methods make physiological motion compensation an open and challenging problem. This work focusses on increasing robustness and efficiency via exploration of the classes of l1- and l2-regularized optimization, emphasizing the use of explicit regularization. Both approaches are based on natural features of the heart using intensity information. Results pointed out the l1-regularized optimization class as the best since it offered the shortest computational cost, the smallest average error and it proved to work even under complex deformations. Robotic-assisted minimally invasive surgery has demonstrated its benefits in comparison with traditional procedures. However, one of the major drawbacks of current robotic system approaches is the lack of force feedback. Apart from space restrictions, the main problems of using force sensors are their high cost and the biocompatibility. In this work a proposal based on Vision Based Force Measurement is presented, in which the deformation mapping of the tissue is obtained using the `2−Regularized Optimization class, and the force is estimated via a recurrent neural network that has as inputs the kinematic variables and the deformation mapping. Moreover, the capability of RNN for predicting time series is used in order to deal with tool occlusions. The highlights of this proposal, according to the results, are: knowledge of material properties are not necessary, there is no need of adding extra sensors and a good trade-off between accuracy and efficiency has been achieved. Stroke is a leading cause of disability, being motor impairments its major consequence. Despite rehabilitation, more than 60% of the patients report upper-limb motor dysfunction. The design of novel rehabilitation strategies requires objective measures to assess motor impairment and recovery. In a previous study, we proposed to use the synergy components of the unaffected limb as a reference to be targeted by rehabilitation, since they are proven to explain healthy motor control and to be altered after stroke. We demonstrated that healthy subjects have very similar control structures (synergies and activation vectors) in their right and left arms. Here, we investigate the existence of movement-specific control strategies. To do so, we analyze the inter-subject similarity of the healthy control structure in twelve common stroke rehabilitation exercises and we evidence that motor control is movement specific and generalizes across different subjects and their limbs. However, the similarity degree depends on the movement, suggesting that novel training protocols should purposely choose the rehabilitation exercises to ensure maximum control similarity with the reference pattern. The poor rehabilitation success rate, including the cases of ineffective and detrimental adaptations, make stroke a leading cause of disability. Thus, it is essential to recognize the mechanisms driving healthy motor recovery to improve such rate. Stroke alters the Synergy Architecture (SA), the modular muscle control system. So SA analysis may constitute a powerful tool to design and assess rehabilitation procedures. However, current impairment scales do not consider the patient's neuromuscular state. To gain insights into this hypothesis, we recorded multiple myoelectric signals from upper-limb muscles, in healthy subjects, while executing a set of common rehabilitation exercises. We found that SA reveals optimized motor control strategies and the positive effects of the use of visual feedback (VF) on motor control. Furthermore we demonstrate that the right and left arm's SA share the basic structure within the same subject, so we propose using the unaffected limb's SA as a reference motion pattern to be reached through rehabilitation. The position analysis of a planar mechanism is based on obtaining the roots of its characteristic polynomial. In general, this polynomial is the result of a system of kinematic equations which they are derived from closure condition of the mechanism, widely known as independent kinematic loop equations or loop closure equations . This way of solving the position analysis of kinematic chains introduces complex variable eliminations, and in general trigonometric substitutions. Recently, the use of methods based on bilateration to solve the position analysis, has been shown to avoid these variable eliminations and trigonometric substitutions in planar mechanism. In this work it is shown how this method based on bilateration can be use to automatically generate closure conditions of a planar mechanism. Motion compensation constitutes a challenging issue in minimally invasive beating heart surgery. Since the zone to be repaired has a dynamic behaviour, precision and surgeon's dexterity decrease. In order to solve this problem, various proposals have been presented using ℓ2-norm. However, as they present some limitations in terms of robustness and efficiency, motion compensation is still considered an open problem. In this work, a solution based on the class of ℓ1 Regularized Optimization is proposed. It has been selected due to its mathematical properties and practical benefits. In particular, deformation is characterized by cubic B-splines since they offer an excellent balance between computational cost and accuracy. Moreover, due to the non-differentiability of the functional, the logarithmic barrier function is used for generating a standard optimization problem. Results have provided a very good tradeoff between accuracy and efficiency, indicating the potential of the proposed approach and proving its stability even under complex deformations. A connection between two vessels or other tubular structures is known as anastomosis, one of the most common procedures in its field but, at the same time, one of the most complex suture-based techniques. This procedure requires not only a lot of skill and dexterity but also a lot of attention and plenty of concentration from the surgeon. This makes many of the actions to be performed irregularly, exposing the patient to human error resulting from the monotony. On the other hand, the field of robotics has earned itself a place in medicine, especially as assistants during a surgical intervention. Even so, medical robotics is quite young and still has not done much in the field of vessel anastomosis. Therefore, this paper presents a preliminary study of the most common suturing techniques, taking into account their typology and performance, within all the possible anastomosis procedures known. Subsequently, a detailed study of workflow and actions during an anastomosis is made, obtaining a diagram for each of the suturing techniques studied. This allows analyzing all procedures and to create a tool to find those actions and repeated tasks and/or common in all of them, indicating which of these are potential candidates for an automation study. This preliminary work focuses on finding where robotics can help to avoid rutinary tasks, which can be learned in a mechanical level and therefore, relatively easy to be automated using a robotic system or to assist the surgeon in certain tasks that need a lot of skill and attention. One of the challenges of the robotics community is to develop robots that behave more and more autonomously. Therefore, it is necessary to establish new design criteria, as well as more complex methodologies supporting the analysis of associated risks. The procedure described in this paper includes civil liability as an additional criterion to validate the safety of a surgical robot. In order to understand the concept, a methodology is presented through the description of a simple case. This work aims to establish the basis for a further implementation. Stroke is a major cause of disability, usually causing hemiplegic damage on the motor abilities of the patient. Stroke rehabilitation seeks restoring normal motion on the affected limb. However, normality’ of movements is usually assessed by clinical and functional tests, without considering how the motor system responds to therapy. We hypothesized that electromyographic (EMG) recordings could provide useful information for evaluating the outcome of rehabilitation from a neuromuscular perspective. Four healthy subjects were asked to perform 14 different functional movements simulating the action of reaching over a table. Each movement was defined according to the starting and target positions that the subject had to connect using linear trajectories. Bipolar recordings of EMG signals were taken from biceps and triceps muscles, and spectral and temporal characteristics were extracted for each movement. Using pattern recognition techniques we found that only two EMG channels were sufficient to accurately determine the spatial characteristics of motor activity: movement direction, length and execution zone. Our results suggest that muscles may fire in a patterned way depending on the specific characteristics of the movement and that EMG signals may codify such detailed information. These findings may be of great value to quantitatively assess post-stroke rehabilitation and to compare the neuromuscular activity of the affected and unaffected limbs, from a physiological perspective. Furthermore, disturbed movements could be characterized in terms of the muscle function to identify, which is the spatial characteristic that fails, e.g. movement direction, and guide personalized rehabilitation to enhance the training of such characteristic. Robotic rehabilitation therapies are an emerging tool in the field of Neurorehabilitation in order to achieve an effective therapeutic development in the patient. In this paper, the role of disturbances caused by muscle synergies or unpredictable effects of artificial stimulation in muscles during rehabilitation therapies is analyzed. In terms of gait assistance it is also important to maintain synchronized movements to ensure a dynamically stable gait. Although, disturbances affecting joints are corrected by a force control approach, we define two methods to ensure stability and synchronization of joint movements in the trajectory to be followed. The performance of the presented methods is evaluated in comparison with a preplanned trajectory to be followed by the patients. Endowing current surgical robotic systems with haptic feedback to perform minimally invasive surgery (MIS), such as laparoscopy, is still a challenge. Haptic is a feature lost in surgical teleoperated systems limiting surgeons capabilities and ability. The availability of haptics would provide important advantages to the surgeon: Improved tissue manipulation, reducing the breaking of sutures and increase the feeling of telepresence, among others. To design and develop a haptic system, the measurement of forces can be implemented based on two approaches: Direct and indirect force sensing. MIS performed with surgical robots, imposes many technical constraints to measure forces, such as: Miniaturization, need of sterilization or materials compatibility, making it necessary to rely on indirect force sensing. Based on mathematical models of the components involved in an intervention and indirect force sensing techniques, a global perspective on how to address the problem of measurement of tool-tissue interaction forces is presented. 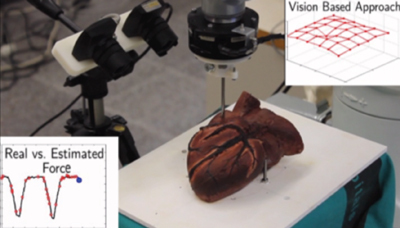 Heart motion compensation is a key issue in medical robotics due to the benefits that minimally invasive beating heart surgery offers over traditional cardiac surgery. Although different proposals have been presented, nowadays, there is not yet a suitable solution working in real clinical environments due to the lack of robustness of existing methods. The process of heart motion estimation required to produce the compensation actions can be tackled as a process of three iterative steps. The first based on generating a deformation model from the processing of a video sequence of the beating heart. The selection of a deformation model is crucial in the sense that it has to offer both valuable information and good computational performance. These characteristics are required when the reaction time has a significant repercussion over the system behavior, as in this case. This paper, presents a computational analysis of deformation model based on interpolation methods. In particular, wavelet and thin-plate splines are evaluated. The significance of this study relies on the fact that it is a reference starting point of reference for creating both a common framework and a robust solution. In addition, the obtained results will contribute to increase the robustness from the initial stage of the solution. Heart motion compensation is a challenging problem within medical robotics and it is still considered an open research area due to the lack of robustness. As it can be formulated as an energy minimization problem, an optimization technique is needed. The selection of an adequate method has a significant impact over the global solution. For this reason, a new methodology is presented here for solving heart motion compensation in which the central topic is oriented to increase robustness with the goal of achieving a balance between efficiency and efficacy. Particularly, genetic algorithms are used as optimization technique since they can be adapted to any real application, complex and oriented to work in real-time problems. The authors present an introductory work for the implementation of an international cooperative project aimed at designing, developing and validating a new generation of ergonomic robotic suits, wearable by the users and controlled by the human brain. The aim of the proposers is to allow the motion of people affected by paralysis or with reduced motor abilities. Therefore, the project will focus on the fusion between neuroergonomics and robotics, also by means of brain-machine interfaces. Breakthrough solutions will compose the advanced robotic suit, endowed with soft structures to increment safety and human comfort, and with an advanced real-time control that takes into account the interaction with the human body. Surgical robots are endowed with valuable features that allow surgeons improving their work in terms of accuracy, quality, efficiency and liability. Tremor reduction, scaled movements, virtual fixtures, pre and intraoperative imaging are some examples of enhancing aids for the surgeon. Moreover, being robotics surgery still at an early phase of development, current research efforts are focused to develop robotic systems able to solve more complex tasks, though the associated costs of robotics makes the convenience of its use in some kind of interventions questionable. After analyzing the main performances and limitations of current surgical robots, this paper foresees advances towards ideal robotic systems that satisfy the requirements of future robots. The use of pose-based features has demonstrated to be a promising approach for human motion recognition. Encouraged by the results achieved, a new relational pose-based feature, Trisarea, based on geometric relationship between human joints, is proposed and analysed. This feature is defined as the area of the triangle formed by connecting three joints. The paper shows how the variation of a selected set of Trisarea features over time constitutes a descriptor of human motion. It also demonstrates how this motion descriptor based on Trisarea features can provide useful information in terms of human motion for its application to action recognition tasks. Control theory, focusing on controlling physical systems, has been studied for long. In order to face diverse situations different control strategies have been defined that rely in aspects like predictability, knowledge of system behavior, parameters estimation and so. The field of rehabilitation, and specially neuroreabilitation, poses new questions and challenges as the system to be controlled is a robot that cooperates with a human, which may act in an unpredictable and random way. The human-robot physical contact and the need to assure human integrity constitute additional conditioning factors. This paper describes a control strategy that is an extension of the classical adaptive control approach, oriented to include a human in the loop, which interacts with the robot through neurological signals. An additional fact is the still very poor interpretation of neurological input commands which results in uncertain and ambiguous inputs to the rehabilitation robot controller. This paper presents a Robotic Platform that allows the evaluation of novel rehabilitation therapies by combining assistance and assessment. The robotic platform control loop consists of three nested elements. First, the patient wrist is firmly attached to a redundant robot running an impedance based low-level control loop. Secondly, an Assistance Loop, involving a GUI for the therapist to set the parameters, and an Assist-as-Needed exercise execution thread. Finally, the Assessment Loop continuously computes and displays the evolution of the performance and suggests new parameters for the given therapy. The suggested architecture has proved to be able to successfully evaluate two therapy aspects: the effect of the assistance levels (fully assisted, non-assisted and resistive mode) and the effect of a misalignment between the robot and the patient’s elbow rotation axis. From the first experimental tests of the assessment loop, it is expected that the nature of this implementation allows the systematic evaluation and comparison of a much broader range of robotic techniques for upper limb rehabilitation and clinical assessment. Teleoperation, by adequately adapting computer interfaces, can benefit from the knowledge on human factors and psychomotor models in order to improve the effectiveness and efficiency in the execution of a task. While scaling is one of the performances frequently used in teleoperation tasks that require high precision, such as surgery, this article presents a scaling method that considers the system dynamics as well. The proposed dynamic scaling factor depends on the apparent position and velocity of the robot and targets. Such scaling improves the performance of teleoperation interfaces, thereby reducing user's workload. Robot-assisted rehabilitation therapies usually focus on physical aspects rather than on cognitive factors. However, cognitive aspects such as attention, motivation, and engagement play a critical role in motor learning and thus influence the long-term success of rehabilitation programs. This paper studies motor-related EEG activity during the execution of robot-assisted passive movements of the upper limb, while participants either: i) focused attention exclusively on the task; or ii) simultaneously performed another task. Six healthy subjects participated in the study and results showed lower desynchronization during passive movements with another task simultaneously being carried out (compared to passive movements with exclusive attention on the task). In addition, it was proved the feasibility to distinguish between the two conditions. The design of mechanical joints that kinematically behave as their biological counterparts is a challenge that if not addressed properly can cause inadequate forces transmission between robot and patient. This paper studies the interaction forces in rehabilitation therapies of the elbow joint. To measure the effect of orthosis-patient misalignments, a force sensor with a novel distributed architecture has been designed and used for this study. A test-bed based on an industrial robot acting as a virtual exoskeleton that emulates the action of a therapist has been developed and the interaction forces analyzed. This paper presents a novel teleoperation paradigm, the Virtual Robot (VR), focused on facilitating the surgeon tasks in minimally invasive robotic surgery. The VR has been conceived to increase the range of applicability of traditional master slave teleoperation architectures by means of an automatic cooperative behavior that assigns the execution of the ongoing task to the most suitable robot. From the user's point of view, the VR internal operation must be automatic and transparent. A set of evaluation indexes have been developed to obtain the suitability of each robot as well as an algorithm to determine the optimal instant of time to execute a task transfer. Several experiments demonstrate the usefulness of the VR, as well as indicates the next steps of the research. The main goal of this chapter is to propose a guideline for human-robot systems focused on ergonomic haptic interaction. With this aim, this model presents several main parts: a set of heuristic indicators in order to identify the attributes of the haptic interaction, the relationship between indicators, the human task and the haptic interface requirements and finally an experimental task procedure and a qualitative performance evaluation metrics in the use of haptic interfaces. The final goal of this work is the study of possible applications of haptics in regular laboratory conditions, in order to improve the analysis, design and evaluation of human task over haptic interfaces in telerobotic applications. This paper focuses on the use of virtual fixtures to improve the learning of basic skills for laparoscopic surgery. Five virtual fixtures are defined, integrated into a virtual surgical simulator and used to define an experimental setup based on a trajectory following task. 46 subjects among surgeons and residents underwent a training session based on the proposed setup. Their performance has been logged and used to identify the effect of virtual fixtures on the learning curve from the point of view of accuracy and completion time. Virtual fixtures prove to be effective in improving the learning and affect differently accuracy and completion time. This suggests the possibility to tailor virtual fixtures on the specific task requirements. La robótica en el campo de la medicina ofrece un gran potencial y es motivo de investigación en numerosos centros en todo el mundo. Sin embargo, en sus distintos ámbitos: asistencia, rehabilitación y cirugía, encuentra todavía muchas limitaciones que condicionan su amplia implantación. Robotics has shown its potential not only in assisting the surgeon during an intervention but also as a tool for training and for surgical procedure's evaluation. Thus, robotics can constitute an extension of simulators that are based on the high capabilities of computer graphics. In addition, haptics has taken a first step in increasing the performance of current virtual reality systems based uniquely on computer simulation and their corresponding interface devices. As a further step in the field of training and learning in surgery, this work describes a robotic experimental workstation composed of robots and specific measuring devices, together with their corresponding control and monitoring strategies for orthopaedic surgery. Through a case study, humerus arthroplasty, experimental evaluation shows the possibilities of having a test bed available for repetitive and quantifiable trials, which make a reliable scientific comparison between different surgical strategies possible. Perspective projection presents objects as they are naturally seen by the eye. However, this type of mapping strongly distorts their geometric properties as angles, which are not preserved under perspective transformations. In this work, this angular variation serves to model the visual effect of perspective projection. Thus, knowing that the angular distortion depends on the point of view of the observer, it is demonstrated that it is possible to determine the pose of an object as a consequence of its perspective distortion. It is a computational approach to direct perception in which spatial information of a scene is calculated directly from the optic array. Experimental results show the robustness provided by the use of angles and establishes this 3D measurement technique as an emulation of a visual perception process. The concept and design of a friendly human-machine interaction system for an adapted robotized kitchen is presented. The kitchen is conceived in a modular way in order to be adaptable to a great diversity in level and type of assistance needs. An interaction manager has been developed which assist the user to control the system actions dynamically according to the given orders and the present state of the environment. Real time enhanced perception of the scenario is achieved by means of a 3D computer vision system. The main goal of the present project is to provide this kitchen with the necessary intelligent behavior to be able to actuate efficiently by interpreting the users' will. The growth of robotics in the surgical field is consequence of the progress in all its related areas, as: perception, instrumentation, actuators, materials, computers, and so. However, the lack of intelligence of current robots makes teleoperation an essential means for robotizing the Operating Room (OR), helping in the improvement of surgical procedures and making the best of the human-robot couple, as it already happens in other robotic application fields. The assistance a teleoperated system can provide is the result of the control strategies that can combine the high performance of computers with the surgeon knowledge, expertise and will. In this lecture, an overview of teleoperation techniques and operating modes suitable in the OR is presented, considering different cooperation levels. A special emphasis will be put on the selection of the most adequate interfaces currently available, able to operate in such quite special environments. The design of orthotic devices that tries to fit to the anthropomorphic structure of human limbs faces the problem of achieving the highest approximation to the anatomical kinematics. This paper studies the main characteristics and performances of orthotic devices, mainly focusing on the upper limbs, and proposes a solution to the problem of the superposition of rotation and displacement of some joints, as the shoulder, elbow or knee. A 3 DoF virtual joint is proposed to emulate a human joint, solving the isocentricity and size adaptation of most current orthosis. A new method for obtaining a three-dimensional volumetric reconstruction from a set of views improving the classical Shape from Silhouette method (SFS) is presented. SFS approaches can be easily accelerated through hardware and software techniques but they are very sensible to errors arising during calibration and segmentation processes so they present difficulties when dealing with real images. This paper proposes a new algorithm which uses the information about pixel segmentation uncertainty contained in each view in order to get a reliable 3D reconstruction of the scene. Aggregation of the projected uncertainties permits to classify scene's voxels by means of a decision rule but also makes it possible to create a three-dimensional confidence map of the scene. As a consequence, the regions where more information is needed can be foreseen. Sample reconstructions from real image sets are presented and evaluated. The main goal of this work is to propose a haptics guideline in human-robot systems focused on the relationship between the human and robot task, the use of a physical interface and the object to manipulate. With this aim, this guideline presents two main parts: a set of heuristic indicators and a qualitative evaluation. In order to assess its ergonomic validation, an application over a well known haptics interface is presented. The final goal of this work is the study of possible applications in regular laboratory conditions in order to improve the design and use of human-robot haptic interfaces in telerobotics applications. Teleoperation is essential for applications in which, despite the availability of a precise geometrical definition of the working area, a task cannot be explicitly programmed. This paper describes a method of assisted teleoperation that improves the execution of such tasks in terms of ergonomics, precision, and reduction of execution time. The relationships between the operating spaces corresponding to the human-robot interface triangle are analyzed. The proposed teleoperation aid is based on applying adaptive transformations between these spaces. Continuous advances on diagnostic techniques based on medical images, as well as the incorporation of new techniques in surgical instruments are progressively changing the new surgical procedures. Also, new minimally invasive techniques, which are currently highly consolidated, have produced significant advances, both from the technological and from the surgical treatment perspectives. The limitations that the manual realization of surgical interventions implies, in what refers to precision and accessibility, can be tackled with the help of robotics. In the same way, sensor based robot control techniques are opening new possibilities for the introduction of more improvements in these procedures, either relying on teleoperation, in which the surgeon and the robot establish their best synergy to get the optimal results, or by means of the automation of some specific actions or tasks. In this article the effect of robotics in the evolution of surgical techniques is described. Starting with a review of the robotics application fields, the article continues analyzing the methods and technologies involved in the process of robotizing surgical procedures, as well as the surgeon-robot interaction systems. A multi-robot cooperation station for nano-bio characterization of biological specimens is presented. The station is composed of two long travel range and high resolution robots equipped with self-sensing nanoprobes that are able to cooperate with each other and with standard AFM systems, over a common sample. The robots are guided by the use of an upright high-depth-of-field optical microscope to perform complex nano-bio characterization experiments. To achieve the required precision between the two robots reference frames, specific image processing techniques are needed. One of the tips is dedicated to acquire the topography of the sample at nano scale while the second probe performs the biocharacterization experiments. The obtained results show that the two robots can cooperate within the required resolution in bacterial nanomechanical characterization while high resolution topographic images are acquired. This paper presents a strategy for a cooperative multirobot system, constituting a virtual robot. The virtual robot is composed of a set of robotic arms acting as only one, transferring the execution of a teleoperated task from one to another when necessary. To decide which of the robots is the most suitable to execute the task at every instant, a multiparametric decision function has been defined. This function is based on a set of intrinsic and extrinsic evaluation indexes of the robot. Since the internal operation of the virtual robot must be transparent to the user, a control architecture has been developed. This paper presents a manipulation and measurement aid for tasks carried out in micro-nano environments operating with scanning AFM. In teleoperated manipulation or measurement over a given point of the target, where a slow and precise movement is necessary, the developed system increases the accuracy in this point producing a space deformation. In automatic scanning, the adjusted selection of the target, through assisted image segmentation, enables to reduce the working time. Baxter: Robot Baxter research edition, with two sensorized arms and with integrated vision The robot operates under OROCOS and is provided with an anticollision application for a safe operation of its two arms.